... maybe it happens because your closet is cluttered! Perhaps your closet is not as bad as this one. Even if your closet looks fairly in order, you probably are not as organized as you would like. By following a system of organizing, your mornings will have less stress! These pictures illustrate your state of mind when getting ready in the morning...Chaotic!! It is tough for anyone to overcome the start of a day like this! Believe me, MSP is not and will never confess to being "perfectly" organized. I have my moments of closet clutter. There were days when I could not find something to wear. It's funny; I once had twice as many clothes as I do now. However, I was constantly battling with myself on what to wear! The eye opening experience came when I began sharing a closet with my DH many years ago. He breathes organization!! To his credit he never criticized me for my side of the closet. I am sure on many occasions as I was running late he must have thought how out of control I was. Searching and tossing to find the right look took a lot of time! We share the laundry chores. On the days that it was my turn to put the clothes away I never had a problem knowing were to put his... he had a system! He could be ready in no time flat. He is always calm when leaving the house. I seemed to be in more of a hurry! It would bother me when on his turn to do the laundry he always placed my clothes on the bed. I would on occasion tell him to go ahead and put them in the closet for me. He only did it a few times and then the clothes would be back on the bed. I realized later that he didn't want to be involved in the "search and rescue" aspect of my closet. I lacked a good system! We all have some good habits and some bad habits. My DH has great habits that work in the closet...(Believe me he has some bad habits too, but that's another story) With my DH's ideas for closet organizing that I "borrowed" from him, plus with my retail background I was able to put together something that makes dressing a breeze! Finding a terrific outfit to set out the night before has never been easier! The first step for me in organizing my closet was what I now call the Closet Purge. Once purged, organizing with my system and working with my basic pieces has literally changed my life! Nothing has given me more satisfaction than starting each day with an air of confidence and calmly dressing into something I look great in! I removed the morning stress and the unflattering clothes—all at the same time! If you only do "one" thing that I suggest on this website - please do this one! PURGE YOUR CLOSET. It will change your life! I honestly know it will. I get more emails from Systers telling me how purging their closet and my organizing plan has brought such a positive outlook to their life! 1. Spread out your wardrobe so all items are immediately visible. 2. Hang everything back up BACKWARDS...this way you'll quickly start seeing what you wear on a regular basis. You may want to purge some more! 3. When you buy something new, remove something not being worn. This will keep the clutter build-up from happening again! Your newly organized closet will become your best friend every morning because its where you'll happily start each day. Here are photos of what my closet looks like inside. I hope they inspires you to create your own special boutique where you can 'shop' each day! 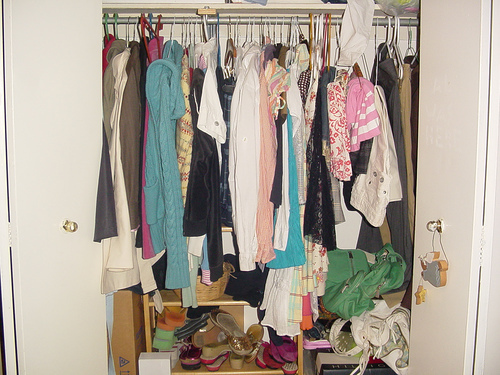 Another tip is to DOUBLE your closet space by having TWO racks instead of the usual ONE. As you can see in the photo, my pants are hung on the bottom rack and tops are above. Just about all standard closets have an 8-foot ceiling, so (depending on your height) you can certainly use this space to your advantage by possibly moving the top rack up and installing another rack underneath. The bottom rack is slightly shorter in length than the one above it because I’ve allowed about a 2-foot space for longer garments (coats, dresses, etc.). Above the top rack is a place for smaller luggage pieces or out-of-season items. Another major item I just couldn’t do without is the cubbyhole unit where I keep my shoes—no scrambling under the clothing racks to find them. These units are moderately priced and can be purchased at just about any home improvement type store. I got so excited about this idea that I added a couple of units with drawers in which I keep belts, underwear, socks and miscellaneous items. Works for me! On the opposite wall of my closet are metal shelf units on which I have sweaters, t-shirts and items that can be folded. Below is space for boots, etc. Above is a rack to hold my purses. Have you noticed? EVERYTHING IS VISIBLE! 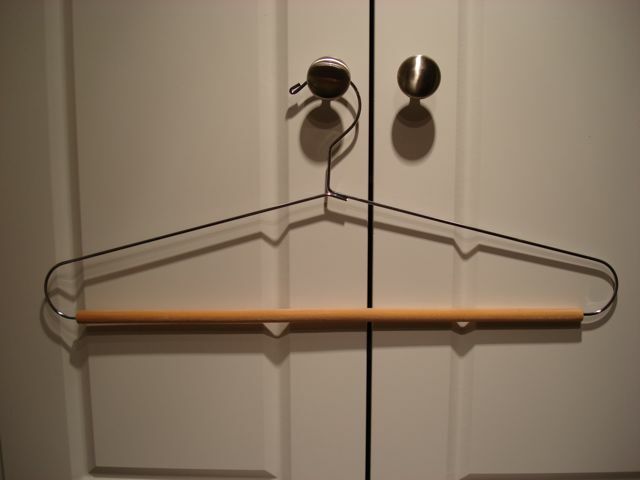 Hangers - Don’t even consider using WIRE coat hangers (the kind you get from the dry cleaners)! I use silver-colored METAL hangers with felt-covered rungs for all of my pants and skirts. The felt covers totally prevent them from sliding (and therefore wrinkling), even it you bump against them. These I purchased at Wal-Mart for a song. (You’ll see black hangers in the photo, but those are from my old days in retail and are unavailable). 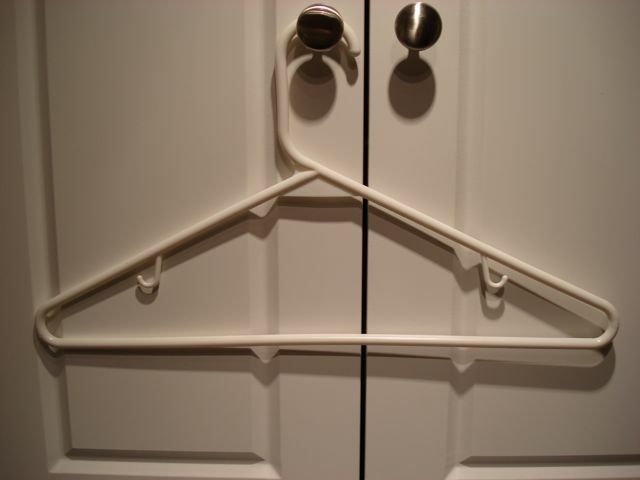 The other hangers I use are the white plastic tubular ones with hooks for camisoles, tank tops, etc. (again, no sliding). A Wall Hook - I left the best for last - one little (well, not THAT little) hook that puts it all together for me! I choose my next day’s outfit the night before and hang all items on this hook (you can see I even put my shoes underneath—guess I have some inborn organizational tendencies, LOL). Then, when I get out of the shower the next day, there’s no stress, no hurried rush, because I know confidently that everything is right there. Perhaps I'll have time for a second cup of coffee? This advanced planning gives me a few extra moments before I have to take on my busy day. I love my closet and this system really works for me. I'm lucky that my DH is handy and with a little encouragement, built me the closet of my dreams. I hope it has given you some ideas on how you can get YOUR closet in order. Clear out the clutter ladies! You'll be so glad you did.